Kalapana Cultural Tours (KCT) has reported that sometime in the early morning of Saturday, Nov. 18, 2017, between 12:30 and 5 a.m., five “specialized” mountain bikes which were locked together at the KCT property in Kalapana were stolen. “The five bikes were valued at about $2,000 to $3,000” said KCT Co-Owner Andrew Dunn. 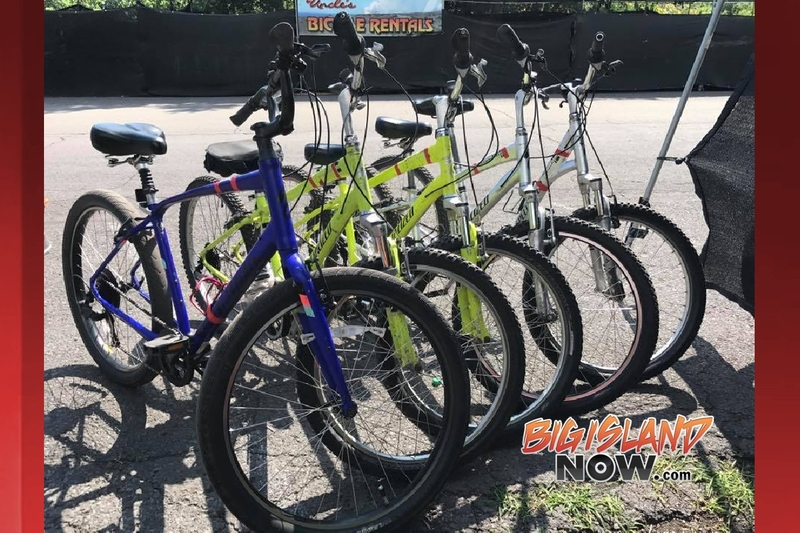 Anyone with information on the bikes is asked to contact the Hawai‘i Police Department’s non-emergency line at (808) 935-3311 or contact KCT at (808) 345-4964. The flow front remains active, and continues to advance across the coastal plain. This afternoon, the flow front was approximately 1.7 km (1.1 miles) from the ocean. The leading front of the flow is the light gray area in the low center area of the photograph. A comparison of a normal photograph (left) with a thermal image (right) taken from roughly the same vantage point. The thermal image shows the concentration of hot surface lava near the flow front, as well as areas of surface breakouts on and above the pali. The amount of channelized lava on the pali has decreased over the past week, but there were still several open channels active today. A closer look at the swiftly moving channelized lava on the pali. This small-scale map shows Kīlauea’s active East Rift Zone lava flow field in relation to the southeastern part of the Island of Hawaiʻi. The area of the active flow field on June 30 is shown in pink, while widening and advancement of the active flow field as mapped on July 5 is shown in red. Older Puʻu ʻŌʻō lava flows (1983–2016) are shown in gray. The blue lines over the Puʻu ʻŌʻō flow field are steepest-descent paths calculated from a 2013 digital elevation model (DEM), while the blue lines on the rest of the map are steepest-descent paths calculated from a 1983 DEM (for calculation details, see http://pubs.usgs.gov/of/2007/1264/). When mapped on Sunday afternoon, the flow front was about 690 m (755 yards) beyond the base of the pali along the western boundary of the abandoned Royal Gardens subdivision; the flow front was about 2.6 km (1.6 miles) from the ocean. A Canadian man who died Tuesday afternoon (May 7) while hiking across a lava field has been identified as 57-year-old Riccardo Scagliati of Victoria, British Columbia. Scagliati and a companion set out from the Kalapana viewing area Tuesday morning. On their return trip they got lost. Scagliati became disoriented and overheated and fell to the ground. His 57-year-old male hiking companion went for help and more water but then was unable to find his way back to Scagliati’s location. Fire Department personnel later found his lifeless body with the help of a helicopter. Rare footage of the Big Island in 1986 & 1987: Kaimu Black Sand Beach & Queens Bath, BEFORE lava. In 1986, Hurricane Estelle sent huge waves over roads along the Puna coastline. High-quality Beta tape was used to document the damage; in the process, footage of beloved Kaimu Beach was included. Then, in 1987, Kapaahu residents needed to evacuate as lava flows approached; again, events were recorded on Beta tapes, including Queens Bath. The Beta tapes have been carefully edited to show only the beauty of this magnificent coastline, before lava flows covered the area. This video shows no burning houses, no roads getting covered, no ocean entry. There is only a single second of lava. Everything was shot in 1987, except for the Hurricane Estelle footage of 1986, which runs from 00:23 to 01:14. Reference points: Kaimu Black Sand Beach begins at 00:00. Drainpipes surfing area is at 00:44. Harry K Brown Park is at 00:59. Queens Bath begins at 1:51. The popular and FREE Kalapana Lava Viewing Area in coastal Puna is now open three hours earlier, from 2 p.m. to 10 p.m. daily, last car allowed in at 8 p.m. The County of Hawai’i enlisted private security firm, Jan Guard Hawaii, to begin management of the area last month. Currently, lava is not reaching the ocean, but a new trail allows visitors to hike out to view the mesmerizing glow and movement – conditions permitting – of the slow-moving surface flow above the pali (cliffs). Visitors should wear sturdy, closed-toe athletic shoes or hiking boots, bring plenty of drinking water, and carry a flashlight if planning to stay after dark. Call the Kalapana Lava Viewing Hotline (808) 961-8093 for current conditions or visit http://volcanoes.usgs.gov/hvo/activity/kilaueastatus.php for Kīlauea Volcano eruption updates. I was on the road today when I got the civil defense message that there was a 3.4 earthquake registered off Kalapana today. Living here in Hawaii close to all the possible natural disasters that could possibly happen here… I still honestly can say there is no better place in the world to be… lucky we live in paradise! David Beliën set out for a quest to Hawaii to attempt to Blow a Lava Bubble instead of glass. To do so he had to get beyond the normal viewing area. Nice detail is that afterwords Pele trembled and shook… we had to get out of there…… VERY quick. Luckily nothing happened.